Victory Be In The Name Of One God, Sri Akal Takht Sahib, Amritsar. Five Member Panthak Committee. The Panth Khalsa, founded by Sahib Sri Guru Gobind Singh Ji on the Baisakhi of 1699 A.D., once again as per the saying of Dhar Tej Krara (be a brave and glorious warrior) and as per Guru’s ordained dictum, Karega Khalsa (the Khalsa shall rule), through the Five member Panthak Committee nominated by the Sarbat Khalsa on 26th January, 1986, fulfils the most cherished dream of the Sikhs (by this declarat ion) of ‘Khalistan’. 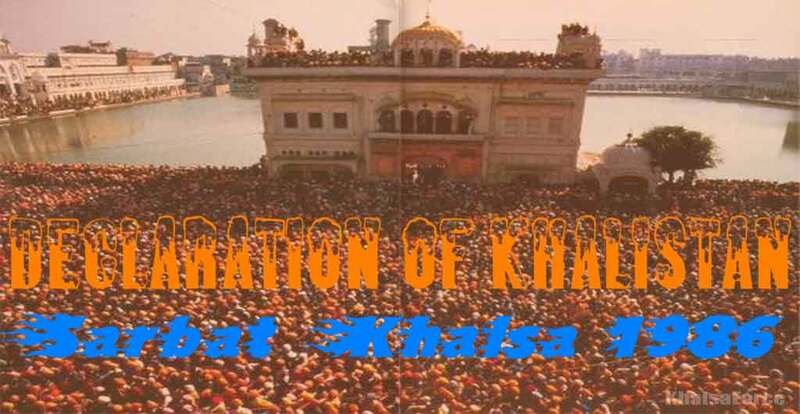 On this auspicious day, from the Holy Akal Takht Sahib, it is (on behalf of the five member Panthak Committee) hereby declares before all the States/Governments and notifies to them that from today onwards, the Khalsa Panth will have its own Home, the ‘Khalistan’, wherein will ever remain high in the air the flags, towers and posts of the Sikhs and wherein the writ of the Khalsa will run supreme. Herein the entire control of the government and. administration shall vest in those who pray for the welfare of all and earn their livelihood by the sweat of labour. The slogan of ‘Khalistan’, which has been moving the hearts of the Sikhs and the Sikh youths for several years and the founding of which had been mentioned by Sant Baba Jarnail Singh Ji Khalsa Bhindranwale, on June 3, 1984 at the time of the military attack on Sri Darbar Sahib and Sri Akal Takht Sahib by the Hindu Government of India. The Sikh Sangat had ratified this idea with great joy and thrill at the time of the Sarbat Khalsa convened on April 13, 1986. The Sikh Sangats repeat their commitment to the dictum ‘The Khalsa shall rule’ in their daily prayer but it is today, that by unbounded grace of the, Guru, the commitment to ‘Khalistan’ is being realised. The Five member Panthak Committee constituted by the Sarbat Khalsa convened by the Damdami Taksal, today hereby declares (the formation of) ‘Khalistan’. This declaration of the Khalistan is made before the Khalsa Panth as well as the Sikh community (comprising of every Sikh; male, female, mother, brother etc.) so that all of us may, in accordance with our individual capacity, contribute to its cause physically, mentally, and financially and may thus prove worthy of our exalted Guru’s saying of “Maran Mumsa, Suria Hak Hai, Jo Hoi Maran Farwano”. Today the five member Panthak Committee calls upon the entire Sikh nation to be ready for all types of sufferings and scarifies. We are not interested in creating any upheaval or in shedding undue blood and we expect the same from others too. We express our firm faith in resolving all the issues cordially and through a dialogue with the Hindu majority and Government of India. We hope that the Government of India will not be blinded by an anti-Sikh attitude underlying Brahminism and will face the reality by giving recognition to the formation of ‘Khalistan’. This would be the real Satyagraha of Bharat. 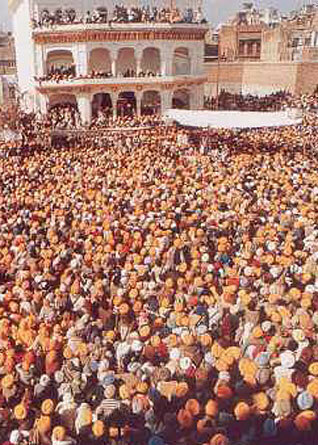 The Khalsa Panth demands political recognition (of ‘Khalistan’) from all the powers of the world, especially America (U.S.A.), England, Pakistan, China, Canada, West Germany and from the Governments which are signatory to the Warsaw Pact, and Italy, France, Japan, Sri Lanka, Nepal, Burma, Bhutan, Bangla Desh, Iran, Iraq, Saudi-Arabia, Israel, Equador etc. We also appeal to the member countries of U.N.O. to grant us recognition, help and assistance for the various political, military and other issues, which have arisen or may arise concerning the human rights in the ‘Khalistan’. We are hopeful that the new government of ‘Khalistan’ will be formed soon but the Panth is seeking its political recognition to avoid the problems that may be caused by the delay in its recognition. We have already demanded recognition by the Government of India which should come forth in order to keep good neighbourly relations (between India and ‘Khalistan’) that will help in restoring peace and brotherhood in Punjab as well as in India, and encouraging toleration so as to end all bitterness of the day. Since ‘Khalistan’ has come into being, the Government of India should (recognising its existence) take political, military and administrative measures such as recalling its army of occupation and para-military forces. It should also direct its administration to execute the writ of ‘Khalistan’. ‘Khalistan’, for the time being, does not intend to bring about any change in the present form of government/administration set up so that day-to-day work may not suffer. Only the seals of Government of Punjab and India will be replaced by those of ‘Khalistan’. The Sikh community is especially commanded to be patient and tolerant. The Government Sikh officials, the Sikh soldiers and all kind of Government/semi-Government employees should, without falling victim to any provocation, continue to their duty honestly till some specific orders from the Panth. We are desirous of avoiding every kind of upheaval, especially the destruction of State property and (natural) resources. The task of forming the Government of ‘Khalistan’ has been left to its Prime Minister/President who will announce its formation at the earliest. All Sikh political organisations are hereby directed to declare their concurrence and allegiance to ‘Khalistan’, and accord all possible help to make it a Success. At this juncture, every Sikh is duty-bound to forge Panthak unity by brushing aside all kinds of differences. The ‘Khalistan’ will function on the lines of the Guru’s saying “Jab Lag Khalsa rahe niara, tab lag tej doe main sara” (so long as the Khalsa remains distinguishable, I shall bestow full glory upon him). No individual will be allowed to exploit others (either economically or socially), particularly the backward village community. Profiteering, black-marketing, adulteration, and all such other offences and social inequalities will not be tolerated by the Khalsa, which will also not allow mental retardation of any individual. No particular community or sect will be allowed to impose selfish will arbitrarily upon others through the medium of press, writing, education or other media of publicity. The constitutional arrangements will be made for the religion to act as the custodian of State. The Sikh religion will be the official creed of Khalistan. Further, it will be a paramount duty of the Government to see that Sikhism must flourish unhindered in Khalistan. The Chief objective before the political and administrative structure of the Khalistan will be the welfare of humanity and social service, as per the saying: “It is sinful to employ our hands and legs, save in the service of others”. Every Sikh, male and female, will be guaranteed to develop and prosper to the best of his or her ability. The lack of education or social backwardness will not be allowed to stand in the way of progress. The monopoly of education with its feudalistic tendencies will also not be allowed to be used as a tool to deprive the uneducated of their rights just as the way in which the children of the urban settlers and the rich, outmanoeuvre all the children of the poor village folk and enjoy the bounties of nature much more than what is due, while On the other hand the children of the poor and the village people continue to remain backward from generation to generation due to illiteracy, poverty and sickness. The Khalistan government would like to base the distribution of all natural resources upon the fulfilment of basic necessities, of life. Feudalism and capitalism will not be allowed to influence the government machinery and the consciousness of the people. Contrary to it, no limitation will be imposed on any individual to prosper and flourish according to the best of his wisdom, labour and ability. The people will be associated fully with the administrative task and their participation will ensure that the red tapism will not re-emerge in Khalistan. At the village level, the local men will be associated with civil, criminal, development and judicial administration of various types so that the false witnesses and police touts may not kill justice by concealing the truth. The association and involvement of the villagers will be secured through more than one (it may be two or three) tier systems to see that opportunity for appeal and arguments may be readily available and at low cost. The policy of Khalistan will be as per the Guru’s wish, ‘Sarbat Da Bhala’ (welfare of all) and a policy of encouraging a civilized life, of promoting the sense of brotherhood of mankind and a sense of involvement. The segregation of humanity based upon caste, jati, birth, locality and colour will not be permitted, and such divisions will be abolished by the use of political power. Likewise, such other cruel and distasteful practices ascribed to social-inequality, especially between Sikh males and females will be removed through the use of political power. It will be the first endeavour of ‘Khalistan’ to maintain cordial relations with its neighbouring countries. The ‘Khalistan Commando Force’ is under the charge of General Hari Singh, its Commander-in-chief. This force shall serve as the nucleus of future defence organisation of ‘Khalistan’. The Sikhs living outside Punjab in India are hereby called upon to settle in Khalistan, so that they may not face any calamity such as the holocaust of November 1984. At the same time, money-minded Hindus are hereby directed not to put hurdles in the way of Khalsa Panth. The Shahi Imam in Delhi, Saiyyed Muhammad Abdulla Bukhari, in his presidential address at the Sikh Seminar on ‘Why not Khalistan?’ held at Chandigarh on February, 1981, while referring to the bloody massacre of Sikhs by Nirankaris on 13 April, 1978, at Arnritsar, had observed that in the free India the Muslims had been subjected to carnage but now the Sikhs too are being butchered. This observation of the Shahi Imarn has proved to be prophetic. The Indian Punjab Government has started the assassination of the Amritdhari (baptised) Sikhs in Punjab. The innocent Sikh youths, without being tried in the courts are being killed in fake police encounters organised regularly. The police chief of Rajasthan has complained about 400 such dead bodies found in the Rajasthan canal. Subsequent to this, in June 1984, the Government of India. under the cover of curfew, butchered the entire Sangat gathered at Darbar Sahib on the eve of Gurpurb celebration of Sri Guru Arjun Dev Ji. Following this, the armed forces besieged all the Gurdwaras of Punjab and killed the Sikhs therein. Similar curfew was imposed on more than 12,000 villages of Punjab and Amritdhari (baptised) Sikhs were hunted down and martyred. Before starting this task of genocide of the baptised Sikhs, the Hindu military officers and sepoys were mentally and emotionally equipped through their official Magazine Bat Cheet for the complete extinction of the Sikhs. It was clearly spelt out in the Bat Cheet as to what were the distinctive marks of the Amritdhari Sikhs. It was mentioned that though outwardly they appear to be innocent, yet in reality they (Amritdhari Sikhs) are murderous, anti-national and extremists. Therefore, it becomes the duty of every security personnel to inform their superiors of the whereabouts of any such Amritdhari, Sikh they come across. Nowhere in the history of the world, such an action has been taken by any Army against the citizens of its own country. After this, when Indira (Gandhi) was assassinated by ‘Beant bullets’, the Hindu Government of India, the new Prime Minster, in league with his political and other official associates/advisers, executed the conspiracy of systematic killings of the Sikhs in Delhi for a number of days. This carnage has put to pale even the bloody carnage of Nadir Shah in Delhi. Bhai Ajit Singh Bains, ex-judge, Punjab and Haryana High court, Chandigarh President of the Enquiry Committee constituted by the Barnala Government, while writing about the 100 false police encounters, expressed surprise Over the fact that in none of these encounters, any police constable or an officer has been shown as wounded, nor any murder case has been registered against police. It is because in India, the government functions as per the saying, “O Lalo, falsehood is reigning all around”. This shows the real meaning of Brahminical principles which proclaim that only ‘Truth wins’ but practise falsehood. The singular aim of Brahminism is to exterminate the Sikh religion root and branch because the Sikh religion is inimical to the Brahminical principles of caste-system and “bipran ki reet” (Karma system). It is what was done by Shankaracharya who secured the death of lakhs of Buddhist monks and destroyed their temples and other religious symbols by the use of military forces. Although the Buddhist religion took its birth in Hindustan, and it spread in far-flung countries like China, Japan, Malaya and Burma etc, yet it was eliminated from its place of birth i.e. India. This reflects the real meaning of the Brahminical motto of Ahimsa Paramo Dharma. (Non violence is the supreme religion). Presently, Indian Government is following the policy of Shankaracharya, determined to annihilate the Sikhs and Sikhism by using all kinds of political, cultural, economic, administrative and military means. This is the real meaning of the (false) claims of Brahminism of preaching tolerance. In free India, attempts are made to put curbs on the minority communities/religions. The voices are raised in the Indian Parliament to put a ban on the conversion of the Hindus. A petition was made before West Bengal High Court to put a ban on the Holy Quran of the Muslims. Attempts are made to secure a total annihilation of the Sikhs, destruction of the Sikh religious symbols through military force, imprisonment of the Kirtani Jathas (signing groups), by registering false cases against them and threatening the Granthis (readers of the religious scriptures) in every village and involving them in false cases too, and putting then behind the bars without trial. We have given details of already referred to the unequivocal anti-Sikh policies of the Indian Government and the manner in which the Amritdhari Sikhs, the products of hard labour of the Sikhism propagation of are being made the targets for elimination through the methods as enunciated in the Bat Cheet. The Government has already exhibited its anti-Sikh attitude by depriving the Sikhs of the fundamental rights through false propaganda of declaring the Sikhs as extremists, murderers and traitors. It has been quite successful in concealing the facts from the world through its use of political power. To achieve this aim, there is censorship and ban on, the entry of foreign correspondents and newspaper editors in Punjab since 1984. If any organisation or individual reported anything concerning the miserable plight and annihilation of the Sikhs, it/he incurred the wrath of the government which stuck like a thunderbolt. As a result of the false propaganda of the government, the Sikhs had to suffer several hardships even in the countries known as the champions of civil Rights such as U.S.A., England, West Germany and Canada. The Government of India, working by proxy (as a support of Brahminism), contemplates that the Sikhs shall depart from the scene like a Bulbul which submits silently to the will of her hunter. Unfortunately, for Brahmins, the Sikhs have been taught by their Gurus to walk on this earth proudly and gracefully like a lion. This is, in brief, the tale of undeclared total war of the Indian Government against the Sikhs. ‘Jang Hind-Punjab da hon laga, Chare Hindustani-Purbi-Dakkhani ji’. (The war between India and Punjab has begun, and the Hindustanis belonging to the East and Deccan have attacked). At this critical juncture we are (still) reluctant to declare a total war against India in retaliation (and have) only (retaliated) through declaration of Khalistan so that we may not be misunderstood and charged as aggressors in the world court. If the Indian government does not stop the naked aggression, the five member Panthak Committee formed on 26th January, 1986, by the Sarbat Khalsa will approach the countries known for supporting the cause of human rights, for every kind of desired help, supply, assistance and sympathy. We appeal for similar help to the U.N.O. We shall, ever feel grateful to the neighbouring countries which sympathise with our cause during our hours of being in crisis. We are also grateful to those Sikh ladies and gentlemen living abroad who have espoused our cause. If they so desire, we are ready to offer the Khalistan citizenship to the Sikhs living abroad. Next post Beadbi (Sacrilege) of Guru Granth Sahib | Historical Gurdwara Sahib of Guru Gobind Singh Ji | Village Lamma Jatpura, Situated Near Jagraon.